It's not easy to sell ultra-high-end video cards so EVGA differentiates itself a little from the other VGA card makers with the GeForce GTX 590 Classified. Available in four editions, these cards offer 630MHz cores, 1260MHz shaders and 3GB GDDR5 clocked at 3456MHz, compared to stock clockspeeds of 607MHz for the cores, 1215MHz for the shaders and 3414MHz for the memory. Prices start at $729.99 for the EVGA GeForce GTX 590 Classified and the EVGA GeForce GTX 590 Classified SLI pack costs $1,429.99. 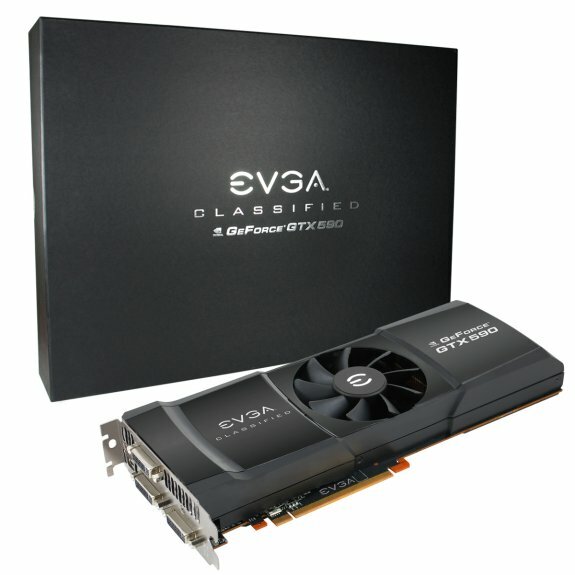 The company also offers the EVGA GeForce GTX 590 Classified Hydro Copper with a watercooling block, this card costs $879.99 and the SLI variant is priced at $1,729.99. All cards include several extras, including an EVGA GeForce GTX 590 T-Shirt, a mousepad, and a gaming poster. The GTX 590 was designed from the ground up for the enthusiast. You have performance that decimates all takers, while at the same time delivering an experience unmatched in the enthusiast market. Acoustics were a primary design focus. With the dual vapor-chamber heatsinks and large cooling fan, the GTX 590 will barely be noticeable even under heavy load. The shroud and heatsink design were both made with the idea of easy removal and installation to clean or to install 3rd-party water cooling. Additionally, the GTX 590 is capable of crunching the latest games at the highest super-sampling anti-aliasing while giving you full 3D Vision Surround support, or you can split up to 4 monitors up - all off of a single card. The GTX 590 truly was designed from the ground up to compromise nothing while delivering the world's fastest graphics card. Need to cool off a bit more? Step up to the plate with the EVGA GeForce GTX 590 Classified Hydro Copper and experience super low graphics card temperatures and maximum overclocking ability. This water block is a full cover, end to end block, and the glowing EVGA logo make it one of the most sleek looking waterblocks on the planet. The innovation does not stop at stability an appearance however; the base plate is made of chrome plated electrolytic C110 copper, and the 0.6mm thin pin matrix provides optimal thermal transfer to ensure the lowest temperatures possible.